Prototype internal swing up toolholder. Swing up tool holders for external threading greatly simplify the threading procedure if the lathe is equipped with facilities for forward and reverse rotation. A swing up tool for external threading is described here. On the left is shown the situation when the swing radius of the tool is much less than the diameter of the hole being threaded. Here the situation is very similar to external threading since the tool can swing up and away from the hole. However as the hole becomes smaller problems arise. If the centre of rotation of the toolholder is to the left of the hole centre, as shown in the second drawing, then if it swings up it will in fact dig deeper into the hole and a jam up is inevitable. The same situation applies if the centre of rotation of the tool is even slightly higher than the centre of the hole, as shown in the third drawing. The fourth drawing shows the situation if the centre of swing of the tool is below the centre of the hole. Here the tool moves up and out from the internal surface of the hole and the danger of digging in is removed. This latter situation is the basis of the prototype toolholder described here. The complete holder mounted on the lathe is shown in the header photo. It consists of a block that is mounted on the toolpost. There is a 6 mm spindle that runs through the block. The spindle attaches to anothe smaller block that holds the threading tool. The end of the spindle can be seen just below the tool. Note that the spindle, which is the axis of swing of the tool is well below the tool itself. The spindle emerges on the other side of the block and is attached of a scrap piece of steel. The purpose of this steel is to provide some weight to force the tool to rotate in the correct direction and also provide a stop, the small socket heat screw resting on the block, to limit the travel of tool. This shows the block, the spindle attached to the weight and the small block holding the tool. The block, weight and tool are all held to the spindle by M4 socket head screws. This shows the small block. 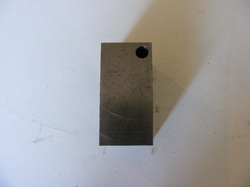 The bottom hole is 6 mm diameter for the spindle and the larger one is 8 mm to hold the tool. Note that the centre of the 8 mm hole is to the right of the centre of the 6 mm hole. This ensures that the cutting forces on the tool force the spindle to try to rotate against the stop on the weight. 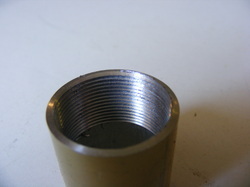 This shows a piece of aluminium tube that has been threaded with a 1 mm pitch metric thread using the toolholder. 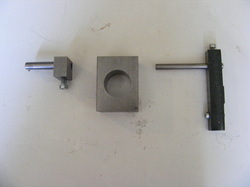 The tool shown here was a development project to test out the toolholder concept. I shall spend more time on it in the future. My intention is to make a number of changes. The most significant of these is to replace the weight with an external swing up toolholder so that the one toolholder will do both internal and external threads. 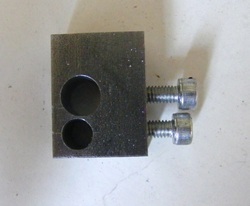 The external toolholder will be similar to that previously described but be bolted directly on the side of the block and share the same spindle.as the prototype shown here. I shall also add a separate stop to the small block that holds the tool for internal threading to get rid of the torsional spring of the spindle.